Veritas Vineyard was established by Dr. John and Dianne Howieson and Jack and Miki Myers. John Howieson was a professor at Oregon Health Sciences University, and an amateur winemaker. A 20 acre vineyard was planted in 1983. The winery was bonded in 1984. 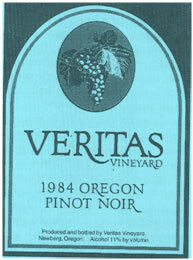 The name “Veritas” reportedly came from Latin “in vino veritas” or “in wine there is truth”. First wines were produced in 1984 at Sokol Blosser. Future vintages were made at the Veritas winery. Howieson continued as winemaker for many years. John Eliassen was the assistant winemaker. The winery was located at 31190 Veritas Lane, Newberg, OR. 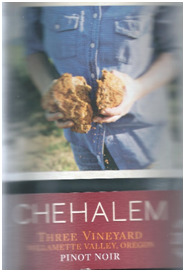 In 1995 Veritas Vineyard was sold to Chehalem Winery.